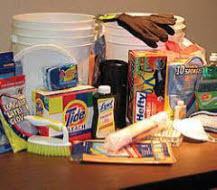 In light of recent hurricanes, Consistory in conjunction with Faith United Neighbors (FUN) group has decided to once again create Emergency Cleanup Buckets for Church World Service. We did this a while back during Lent. Following is the list of items needed, in case you happen to find good sales on these items. Bring any or all of the items you can find. Please feel free to ask store owners for donations. Buckets from Church World Service USA have already been sent to people in the North Carolina area, so they can begin clean up. More buckets are always needed. If everyone gives a little, we can create a lot! Thanks in advance for your help. Please bring items to the pew outside the pastor’s office any time. Please also note that the items are specifically sized etc. to keep the buckets consistent and easy to share. Do not enclose money inside the kits or in the shipping boxes. All cleaning items must be new. All liquid items must be capped and securely tightened. PLEASE NOTE: We will be asking for specific items we do not have enough of as our Angel Tree project this year so that we can complete as many buckets as possible.